After being home for Christmas where we had a lot of traditional recipes got me thinking of the recipes that I use from my mom and grandma. My mom learned how to cook from my dad's mom (mostly). I am not sure where my mom got this rice pilaf recipe from, but she made it for us when we were kids and I still make it often today. The nice thing about it is I always have the ingredients on hand, it's not something you have to go out and buy anything special for. When I make it for a special dinner or where I am going to take it to someones house I use my Corelle dish that I can use on the stove top and finish in the oven. If it is just for the family I make it in a pan stove top. When my mom made it the recipe calls for minute rice (Of course I never used instant rice) it works well with regular rice. When my mom made this recipe she used vermicelli from the Italian store that came in little "nests". It was such a mess when you broke it up to put in the rice. I find it here in our stores already in little pieces...easy peasy! I have a lot of Rosemary plants and I often cut it and dry it, so I can use both fresh and dried Rosemary! Dried rosemary works really well in this dish. With this casserole dish you can use in on the stoves burner to melt the butter and saute the rice, vermicelli and almonds. Melt butter in a casserole dish that can be used stove top as well as in the oven. Add rice, vermicelli, rosemary and almonds. Slowly brown vermicelli, and almonds, the rice will turn white. Add warm chicken broth. Cover and bake at 350 for 20-25 minutes until the rice is tender and liquid is absorbed. This pilaf has a nice delicate flavor that goes well with chicken, and many other dishes. It's certainly an old standby recipe for me! I love it! 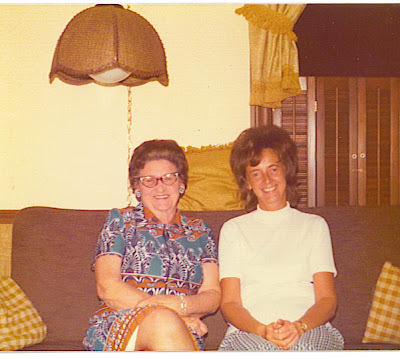 My mom and her mom, my grandma. Probably around the time she started to make this, but I really couldn't tell you for sure! 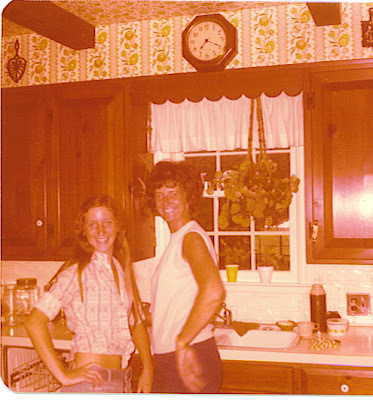 Me and my mom back in the days when I had my days assigned to me when I had to do the dishes. My older sis and I each had 3 days a week and little sis had one! Hmmm...how is that fair? But I'm not bitter about it...look how much fun my mom and I had posing for photos!!! Thanks for going with me down memory lane!!! That looks yummy. Thanks for the recipe! Your rice pilaf looks really good. Your granny looks like my granny. Must be the glasses and hair. how fun it was going down memory lane with you. Thanks for taking us! Looks so good to eat. Thanks for sharing this recipe. I love pilaf. There are so many things you can add to it, or just serve it simply and with lots of flavor as you have done. Agreed....the old recipes are the best! Thank you for yet another family recipe! It looks wonderful! Oh and those vintage photos!!! I love it! Well then this is a family tradition recipe lol! It's about time you continue on the tradition. Good on you, Lyndsey. C'est un riz préparé à l'orientale et c'est très bon. This is a yummy looking pilaf with the rosemary and all those almonds! I also enjoyed your old photos-aren't they fun! That is awesome! I enjoyed the trip with you down memory lane. The rice pilaf is a keeper. come on Lyndsey join the bread group!!! Kind of you to share your family recipe. Like those photos, down memory lane! I love recipes that bring back memories! This looks like a good one! Do you have any Turkish in your family history? When I went to Turkey pilaf was everywhere. Yours looks yum. Thanks everyone. (I can't believe I posted that last pic). Rebecca - I think I just might join the bread group! Thanks to yours and Megans post on the beautiful loaf you both made. Devon - No Turkish in our family, mostly Dutch, and a little English. This is such a simple, but delicious side dish you could serve it with anything. What a beautiful story - for a great recipe. I love rice simply steamed or prepared in a more sophisticated way. I have to try this recipe! excellent presentation..the rice looks so good..loved it..
Pilaf looks inviting. Thanks for your lovely comments.You have got a wonderful space. Heavenly, Laura, Gloria, Deepa, thank you all, you are so kind :) This is such an easy, tasty side dish. Let me know if you do make it! Ramya Manja, you are welcome, and thank you for your nice words and visiting my blog. Padhu, thank you too! I will visit you again. Rachana, it is nice of you to say. It's fun to get the old photos out once in awhile. Cooking often reminds me of childhood and family.